You are here: Home / Reviews / Candy Kittens? 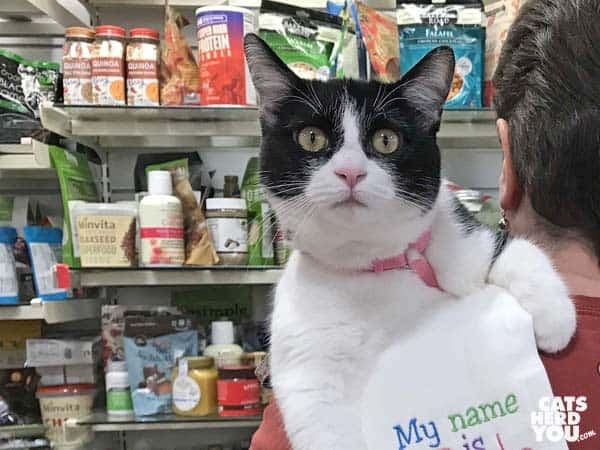 When Cupcake shops in the home decorating store, she doesn’t just look in the pets section. She shops everywhere. That’s how she ended up checking out the fancy foods section full of packaged foods. In it, she found something that caught her eye. 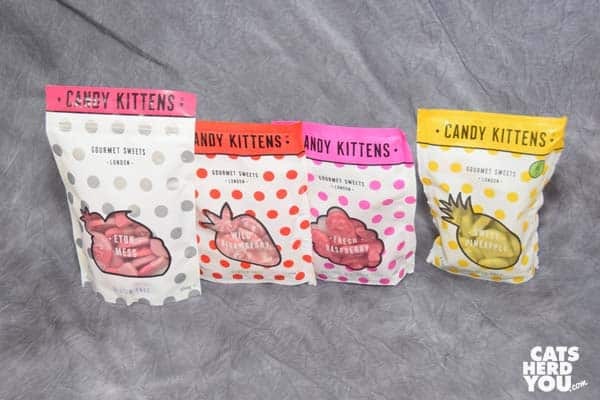 Candy kittens! Of course, we had get some and check them out. Candy kittens are thankfully not made of kittens. 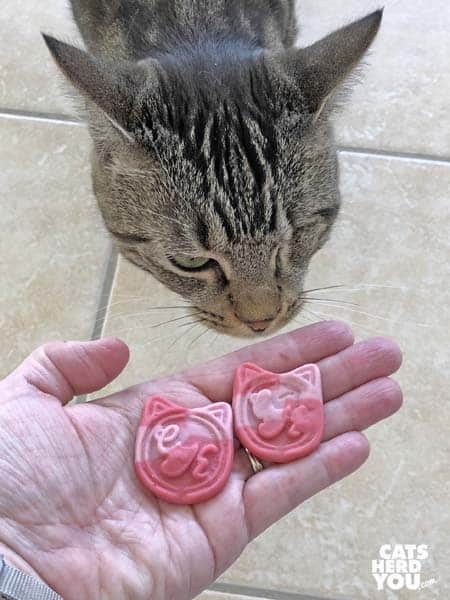 Instead, they are candies in the shape of a cat’s head. They are soft and chewy, but firmer than a gummy bear. Newton heard the bag rattling and thought it sounded like a cat treat, so he had to come take a look. 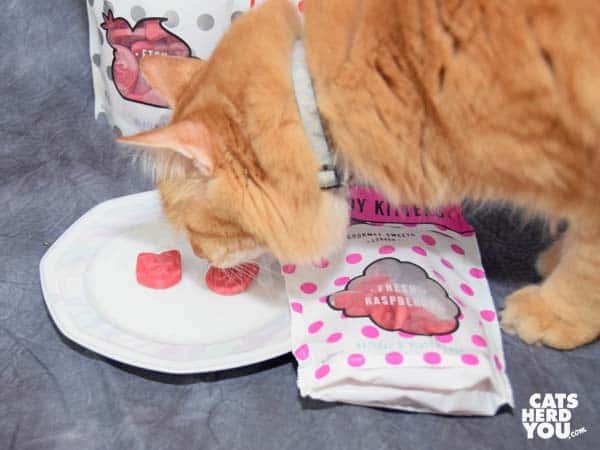 Cats don’t eat fresh raspberry, Newton! Not one to listen, Newton had to get a good sniff before he agreed that cats indeed do not eat fresh raspberry! These candies are very British. So much so that one of the flavors is Eaton Mess. I had to Google to find out what Eaton Mess was. 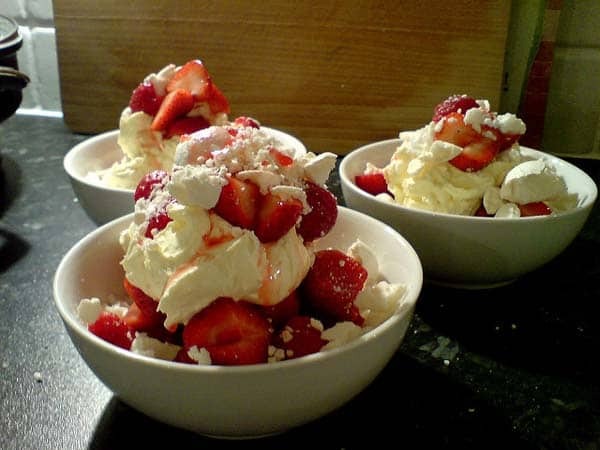 It’s a traditional English dessert made of strawberries, broken pieces of meringue, and double whipped cream. 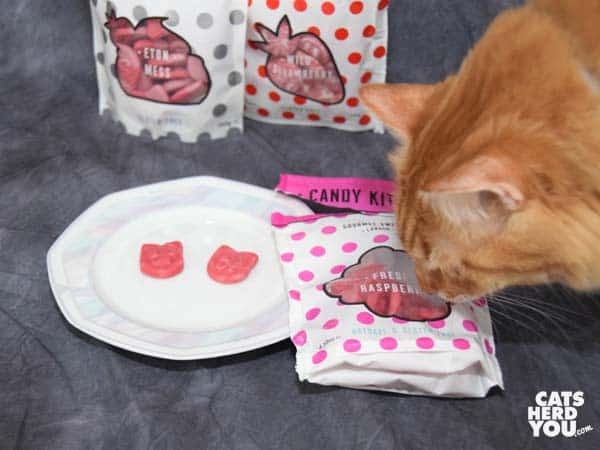 Hey, that dish looks like something a cat might like to taste a little more than they would these candies! The candies are really tasty, though. Not as sweet as a lot of American candy, but fruity. I tried the Eaton Mess flavor, then the fresh raspberry, wild strawberry, and sweet pineapple. But they aren’t for cats. Even Ashton knew it. Better luck next time Cupcake goes shopping, Ashton. My human thinks the Eaton Mess Kittens sound heavenly! They must be darn yummy! The mom would love those kitten candies. I adore you three. Just saying. Again. Very cute! I’d buy them just cuz they’re cats. And because, you know, I like candy. Oh, our mom would LOVE those! They make cute stocking stuffers. I know where I’m shopping this weekend! Thanks, Cupcake!!! How intriguing. And Eaton Mess is yummy, I have had it. And so easy to replicate. I buy those store bought meringue cookies, crumble with whipped cream & berries…and there’s your American mess!